NORTH RICHLAND HILLS — Dr. David Pillow, who began his first family practice clinic in 1955, never minded making house calls — or getting calls at his house. 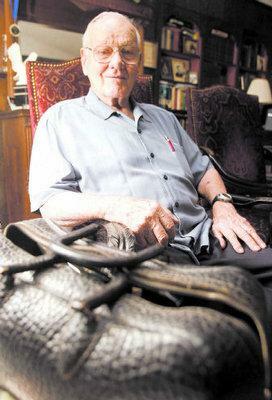 "I’m listed in the white pages, and all my patients have my phone number," said Pillow, 85. That dedication, his empathy, his ability to talk straight to patients and, in recent years, his focus on the healthcare of senior citizens, are the reasons the board of directors of North Hills Hospital in North Richland Hills decided to name the hospital’s new senior health clinic in his honor, hospital officials said. Besides, "I missed a board meeting," joked Pillow, a board member emeritus who lives in Colleyville. "That’s when they did it." An open house and formal ribbon-cutting at the Dr. David Pillow Senior Health Clinic will be held today at 11 a.m. at the clinic site in the Medical Center at Calloway Creek, behind the hospital. There will be a lunch at noon and entertainment from 1 to 3 p.m. The mission of the 8,000-square-foot clinic is to offer seniors healthcare and services they might not ordinarily find at a doctor’s office or hospital, said Linda Reynolds, clinic director. The clinic has been in operation since July. An Austin native who came to Fort Worth at age 16, Pillow started his first family practice clinic 53 years ago, charging $5 for a house call, he said. For his first delivery of a baby, he charged $35, taking his pay on the installment plan. By taking calls at home, he could sometimes save patients a visit to the hospital. Besides, he said with a straight face, "I told them, 'If you call me with something really stupid, I’ll call the drugstore and get you some really expensive medicine.’ "
He has practiced at several hospitals, held teaching positions at medical schools and was one of the founders of Glenview Hospital, now North Hills Hospital, in 1961. Valera Churchman, a retired registered nurse, thought so highly of Pillow as a co-worker at North Hills Hospital that she decided to become his patient. She took her mother to him, too, when her mother was 96. "My mother told me, 'I’d like to see somebody who will listen to me and talk to me,’" said Churchman, 77, of Hurst. "Some doctors don’t have the time to put in and completely check you at the same time they’re talking to you, but he always checked people head to toe." Pillow says his approach is merely common sense. Pillow no longer practices medicine, but "I never really retired. I just changed what I did," he said. He has used a wheelchair or motorized scooter since developing back problems in 2004. But these days, he grabs a ride with family or friends to teach health classes for seniors at Tarrant County College Northeast campus in Hurst. He also hosts monthly question-and-answer health sessions with senior citizens at North Hills Hospital’s H2U (Health and Happiness to You), said Reynolds, who also is director of North Hills Hospital Health and Wellness Program. He tailors his humor-laced talks so seniors will know what to expect as they age — and what questions to ask their doctors, she said. His sessions are so popular there are waiting lists of seniors who want to attend, so sometimes he does "encore performances" on another date, she said. Graduated first in class with medical degree in 1953 from George Washington University School of Medicine in Washington, D.C.